Anti-naturalism comes in two flavors, and both may be reactions against a truly irresistible scientific naturalism. In a world of wicked problems, philosophy must function in a more engaged and interdisciplinary way. A punch may hurt a Nazi, but it won’t change his or her mind. Philosophy is under attack from many sides, but it is far too important to give up on it. Navel-gazing and explorations of the Self may lead the Left to destroy itself from within. The Arab world must return to the scholariship and cosmopolitanism of Bayt Al Hikma. The Internet may show the way. Now there’s proof that supernatural claims of religion hardly suit. 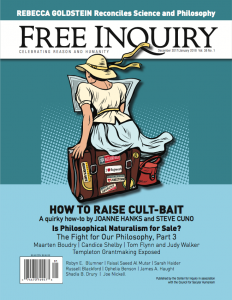 Nicole Scott has been named the new managing editor of Free Inquiry magazine. For the past three years, Nicole Scott has been managing editor of CFI’s newsletter The American Rationalist and assistant editor of Free Inquiry and Skeptical Inquirer magazines. Evidence for ‘Miracles’: Does a ‘Cold-Case’ Approach Redeem the Gospel Accounts? Examining the gospels like cold-case evidence is as absurd as it is unreliable. I’ve forsaken religious certainty—but not without being wistful about it. Finally, the deity consents to an interview. Brown was a passionate lecturer on women’s rights at conferences and other events throughout the world. America’s religious liberty impulse and its Enlightenment impulse have been magnified over time and now tilt overwhelmingly toward the former.